AutoForum has been in the print business for over 25 years, and we have seen a lot of change in both the motor and publishing industries. As global businesses and the people that function within them become more and more fast-paced, access to information is a hot topic. Gone are the days when all you waited for was the morning newspaper and the 8 o’clock news. People need information on an ongoing basis and from a number of different sources and media. When talking to the aftermarket no one medium truly rules out another – we maintain and understand that specifically printed magazines will always have a place - but more and more people want to access information immediately, and wherever they may be. As such no media is better suited than digital, so it cannot be excluded from any meaningful communication campaign. From a communication and marketing point of view, and at it’s most basic, AutoForum delivers content to a targeted audience. We deliver news, brand and product information as well as articles that benefit your business, though our print and digital “channels”. This provides a flow of information that links our brand, and that of our advertisers, to these readers. Print has the most advantageous “lifespan” or physical shelf life - this magazine you are receive in the post will probably be in your possession for anywhere up to a year or even more. The opportunity to create a “conversation” in print is however limited to responses in writing, or reaction to advertising, and occurs over quite a bit of time. on the fly. Click throughs, page visits and responses are all quantifiable too. In addition, the “lifespan” is actually extended in digital media, where years’ worth of archived information are actually available and indexed for you to find easily. So in order to keep in line with shifting industry requirements, budgets, the realities of postal delivery and reader expectations, we have adjusted our frequency and doubled enhanced our online activity. The magazine deserves to be handed around, used as a reference point on your desk, or have bits of it torn out and stuck up on the wall. It provides our advertisers with a respected and proven communication channel to build their brands - and get their products in your hands. The digital channels are available to you as a second option to view the printed information anywhere, and at anytime. Our online edition is hosted by issuu.com allowing for a “page view” reading experience online or on a tablet that you can subscribe to absolutely free. This is the most basic offering, but we have gone far beyond a repetition of the print by uploading daily news through the website, 2 social media channels and email.In addition to AutoForum.co.za we have Twitter and Facebook pages which provide you with the key stories on our website, links you key news and insights. If neither of those work for you, you can sign up for our email newsletter. Our strategy is to become your single point of access to information relevant to the automotive sector and aftermarket. AutoForum has invested heavily in our latest web offering. Not only is it packed with news, but you can search for content by hidden “tags” or keywords. You can use the search or tag clouds which index the content in all stories, pics and adverts and enables search engines such as Google to index and access our content too. We carry all our own news, aggregate relevant articles (with credits) from around the world, and offer you access to the many press releases that suppliers to the automotive sector put out daily. 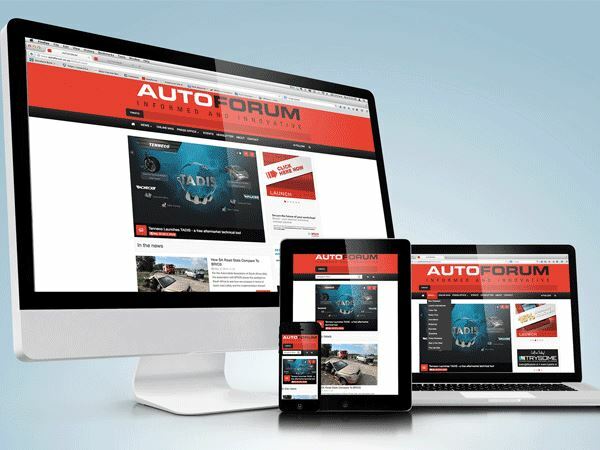 The changes to the site are far more than skin deep – autoforum.co.za is optimised for viewing on any PC or Mac, tablet, iPad and Smartphone by using an user interface that actually interprets the device you are using to view the page, and then formats it to suit.This is designed to offer you the best possible reading and navigating experience – no more trying to zoom in on a tiny section of the page! You also can view our events calendar, listing categorised events relevant to the industry segments, sports and exhibitions and invite businesses to mail through their listings to display on the calendar. This makes planning your own events far easier by being able to see what is happening across the industry in any given week. These events will also be posted to our Facebook and Twitter feeds. it to Facebook or Twitter to have your say. Send us your latest jokes, gags or funny videos, this is our own industry community and we probably all share similar interests, tastes and a collective sense of humour (just keep it clean OK – we moderate everything to avoid abuse or spamming). So get onto our site and have a look around, follow us on Twitter or “like” us on Facebook. Bookmark AutoForum.co.za in your smartphone (on iPhone you can actually place the bookmark as an app icon on your screen) - and get in touch with us today.